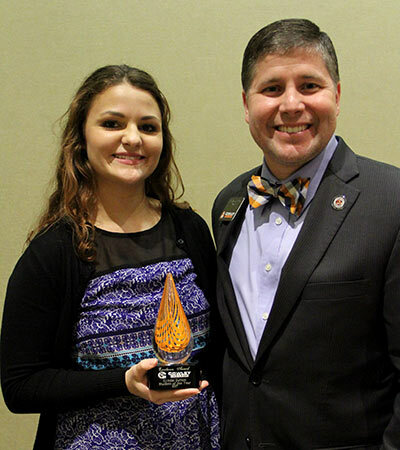 Hard working, involved, and always positive, these are some of the words used to describe Cowley College sophomore Kyndal Dutton, who was named the Student of the Year during the annual Honors and Awards ceremony held Tuesday in the Earle N. Wright Community Room. Dutton was recently named a Phi Theta Kappa Coca-Cola New Century Scholar and will have an opportunity to represent the state of Kansas at the annual Presidents Breakfast at the American Association of Community Colleges Convention held April 22-25 in New Orleans, LA. Along with serving as Cowley College’s vice president of scholarship for Phi Theta Kappa, the sophomore pre-medicine major was a member of the women’s soccer and dance teams at Cowley, is a Cowley Tutor, and student ambassador. She has accumulated a 4.0 grade point average and is a member of the President’s Honor Roll. She was a finalist for Queen Alalah LXXXV and was named the school’s November Student of the Month. Dutton, along with the college’s other Student of the Month selections, were up for the prestigious honor of Student of the Year. Dutton is the daughter of Brian and Kim Dutton of Winfield. She is the granddaughter of Judy and Derryl Rising of Burden, KS, and Lois Henderson of Winfield, KS. She has a sister, Brianna, and a brother, Marshall. After graduating from Cowley, Dutton plans to transfer to Newman University to pursue a degree in nursing. Also during the banquet, Academic Excellence Challenge team sponsor Dianne Flickinger spoke of former Cowley College student and AEC team member Garrett Misora, who was tragically killed in a car accident in November 2016. Flickinger presented Misora’s mother, Carol, with a plaque honoring Garrett. She also said the Garrett Misora Memorial Scholarship has been established by an anonymous donor and that Misora will receive an honorary degree at this year’s Commencement exercises. During the Honors and Awards ceremony a representative from each department at Cowley College honored students that have excelled during the 2016-17 academic year. Cowley College president Dr. Dennis C. Rittle praised the work done by the students and instructors of the college. Kristi Shaw, executive director of enrollment management, and Dr. Harold Arnett, vice president for academic affairs, served as master of ceremonies, while Great Western Dining provided the meal. *Academic Excellence Challenge — Harvey Baker, Daltin Brock, Chase LaPorte, Jesse McCabe, and the late Garrett Misora. *Derek Burroughs Award — Daltin Brock. *Student Ambassadors — Peyton Adams, Kelli Ailey, Morgan Bruce, Stephanie Cabrera, Peyton Cravens, Hannah Coryea, Alicia Dirks, Jose Duque, Kyndal Dutton, Carly Gum, Ashley Huslig, Gunner Johnson, Krystyn Kinzie, Olivia Powell, Teryn Scott, Deidra Shiever. *Outstanding Student Ambassadors –Peyton Adams and Gunner Johnson. *Student Ambassador of the Year –Kelli Ailey. *Resident Assistants — Peyton Adams, Kelli Ailey, Alicia Dirks, Isaiah Evans, Maggie Fink, Victor Goncalves, Kayla Gourley, Blake Graham, Bryce Kinsey, Krystyn Kinzie, Connor Litton, Matheus Martins, Molly McCune, Joseph Stephens, Kylie Wiens, and Taven Wohlford. *Cowley Tutors — Mary Anderson, Jose Duque, Kyndal Dutton, Abby Garcia, Victor Goncalves, Blake Graham, Ashley Huslig, Connor Litton, Steven Lu, Matheus Martins, Olivia Powell, Deidra Shiever, and Tanner Balsters. *Health and Human Services Department — Jeremy DeCoudres. *Business, Computer and Information Technology Department — Dayana Viveros. *Career and Technical Education Department — Gabriela Baeza. *Humanities and Communication Department — Arturo Mendoza. *Natural Science and Mathematics Department — Kyndal Dutton. *Social Science Department — Veronica Marin. *Visual & Performing Arts Department – Shayna Templeton. *ACES — Gage Hinson and Justin Haist. *Act One Drama Club/Theatre — Brianna Baxley, Kristen James, Payton Latney. *Art and Design Club — Abby Cahn, Shayna Templeton, Jesus Originales. *Cowley Student Senate – Kelli Ailey, Karee Britt, Kyrstyn Kinzie, Mary Anderson. *Creative Claws — Austin Crowe. *DECA –Ashley Simpson and Dayana Viveros. *Math & Science Club — Ashley Simpson and Felipe Escalante. *Media Club — Kayla Schenck and Arturo Mendoza. *Phi Theta Kappa — Ashley Huslig and Abby Garcia. *Skills USA — Anthony Koller. *Vocal Music — Riley Paye, Allie Lawrence, Austin Sherman. *Instrumental Music – David Bartlett and Sarah Manning. *Students of the Month – Debra Arnett, Ashley Huslig, Kyndal Dutton, Abby Garcia, Peyton Adams, Tanner Balsters, Stephanie Cabrera, and Teryn Scott.